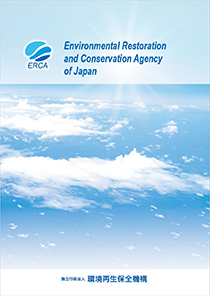 Environmental Restoration and Conservation Agency, ERCA works on various activities; compensation for sufferers of health hazards caused by pollution; promotion of the activities for prevention of health hazards caused by pollution; support to private organizations which work on environmental conservation in the developing areas of the world nations and in Japan through a grant, development of human resources, and provision of information; support of smooth implementation of polychlorinated biphenyl waste disposal; management of funds for the administration and maintenance of final waste disposal sites; provision of medical expenses and other relief benefits to sufferers of asbestos-related disease such as mesothelioma, and lung cancer; and funding operations of the Environment Research and Technology Development Fund (ERDF) which contribute environmental policies. Our goal is to work on these activities with efficiency and dedication and continue to improve our service for people. Adobe Reader is required to view Portable Document Format PDF files. Muza Kawasaki Central Tower, Omiya-cho 1310, Saiwai-Ku, Kawasaki-Shi, Kanagawa 212-8554, Japan. Copyright, Environmental Restoration and Conservation Agency. All rights Reserved.